Here are some snazzy birthday facts about 28th of January 1962 that no one tells you about. Don’t wait a minute longer and jump in using the content links below. Average read time of 11 minutes. Enjoy! What day was my birthday Jan 28, 1962? January 28, 1962 was a Sunday and it was the 28th day of the year 1962. It was the 4th Sunday of that year. The next time you can reuse your old 1962 calendar will be in 2029. Both calendars will be exactly the same! This is assuming you are not interested in the dates for Easter and other irregular holidays that are based on a lunisolar calendar. What day was January 28 this year? There are 281 days left before your next birthday. You will be 58 years old when that day comes. There have been 20,903 days from the day you were born up to today. If you’ve been sleeping 8 hours daily since birth, then you have slept a total of 6,968 days or 19.08 years. You spent 33% of your life sleeping. Since night and day always follow each other, there were precisely 708 full moons after you were born up to this day. How many of them did you see? The next full moon that you can see will be on May 18 at 21:13:00 GMT – Saturday. Fun stat: Your first one billion seconds (1,000,000,000) happened sometime on October 6, 1993. If a dog named Majken - a Chesapeake Bay Retriever breed, was born on the same date as you then it will be 276 dog years old today. A dog’s first human year is equal to 15 dog years. Dogs age differently depending on breed and size. When you reach the age of 6 Majken will be 42 dog years old. From that point forward a medium-sized dog like Majken will age 4.5 dog years for every human year. View the complete list of January 28 celebrity birthdays. Who are the famous January 28 birthdays? Here’s a short list of famous people in history who were born on Jan 28. View the complete list of January 28 famous birthdays. What happened on my birthday – Jan 28th? King Charles VI of France is nearly killed when several dancers’ costumes catch fire during a masquerade ball. Henry VIII dies. His nine-year-old son, Edward VI becomes King, and the first Protestant ruler of England. Walter Arnold of East Peckham, Kent, becomes the first person to be convicted of speeding. He was fined one shilling, plus costs, for speeding at 8 mph, thereby exceeding the contemporary speed limit of 2 mph. Finnish Civil War: Rebels seize control of the capital, Helsinki, and members of the Senate of Finland go underground. The National Football League announced expansion teams for Dallas to start in the 1960 NFL season and Minneapolis-St. Paul for 1961 NFL season. An unarmed United States Air Force T-39 Sabreliner on a training mission is shot down over Erfurt, East Germany, by a Soviet MiG-19. Supergroup USA for Africa (United Support of Artists for Africa) records the hit single We Are the World, to help raise funds for Ethiopian famine relief. In R v Morgentaler the Supreme Court of Canada strikes down all anti-abortion laws, effectively allowing abortions in Canada in all 9 months of pregnancy. The roof of one of the buildings at the Katowice International Fair in Chorzów/Katowice, Poland, collapses due to the weight of snow, killing 65 and injuring more than 170 others. View the complete list of January 28 historical events. What does my birthday January 28, 1962 mean? 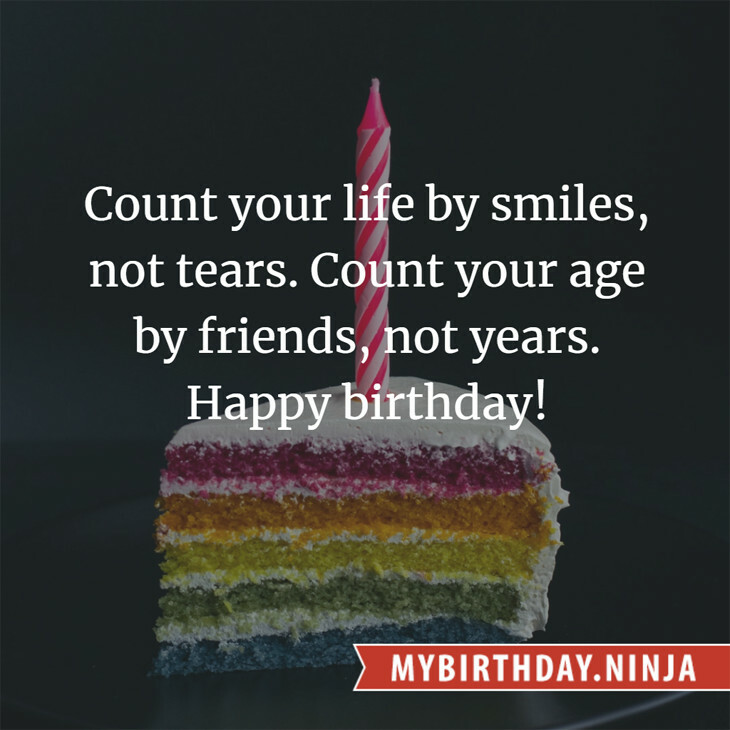 Your birthday numbers 1, 28, and 1962 reveal that your Life Path number is 11. It is a master number that represents intuition, idealism and invention. You have the potential to be a source of inspiration and illumination for people. The following celebrities also have the same life path number: Vicente Aranda, Wendee Lee, Dion DiMucci, Cabral Ibacka, Ray Hildebrand, Nick Mancuso, Maxim Roy, Chrishell Stause, Valentín Elizalde, Nicholas Pryor. What is the birthday horoscope for Jan 28, 1962? The Western zodiac or sun sign of a person born on January 28 is Aquarius ♒ (The Water-bearer) – a fixed sign with Air as Western element. The ruling planet is Uranus – the planet of originality. According to the ancient art of Chinese astrology (or Eastern zodiac), Ox is the mythical animal and Metal is the Eastern element of a person born on January 28, 1962. What is the birthstone for January 28? Garnet is the modern birthstone for the month of January while Emerald is the mystical birth stone (based on Tibetan origin). The zodiac gemstone for Aquarius is garnet. Lastly, the birthday stone for the day of the week ‘Sunday’ is topaz. Fun fact: The birth flower for 28th January 1962 is Carnation for friendship. What is the Love Match for Jan 28, 1962? 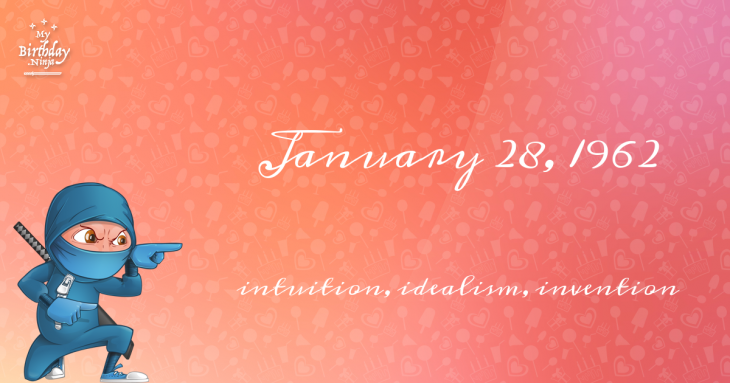 When it comes to love and relationship, you are most compatible with a person born on June 9, 1973. You have a Love Match compatibility score of +163. Imagine being in love with your soul mate. On the negative side, you are most incompatible with a person born on July 20, 1955. Your incompatibility score is -205. You’ll be like a cat and a dog on a love-hate relationship. Arf-arf, I want to bite you. Meow-meow, stay away from me! What is a good birthday trivia for January 28? The number-one hit song in the U.S. at the day of your birth was Peppermint Twist - Part I by Joey Dee and the Starliters as compiled by Billboard Hot 100 (February 3, 1962). Ask your parents if they know this popular song. How many babies were born on January 28, 1962? Base on the data published by the United Nations Population Division, an estimated 111,558,191 babies were born throughout the world in the year 1962. The estimated number of babies born on 28th January 1962 is 305,639. That’s equivalent to 212 babies every minute. Try to imagine if all of them are crying at the same time. What is the popular baby name on 28 Jan 1962? What’s your bizarre Florida Man story? The #FloridaManChallenge is breaking the Internet and social media. Some crazy men, women, or creatures from the Sunshine State are making headlines every day of the year including your birthday. Try this fun exercise. Pick your search engine of choice and type in “florida man January 28” and see what kind of wild news headline you will get. This viral craze started in 2013 and gets resurrected now and then. The latest was from Tumblr and found its way to Twitter. As they say, the rest is history. Here’s a quick list of all the fun birthday facts about January 28, 1962. Celebrities, famous birthdays, historical events, and past life were excluded. Try another birth date of someone you know or try the birthday of these celebrities: June 19, 1970 – Antonis Remos, German-Greek singer; November 2, 1924 – Rudy Van Gelder, American record producer and engineer; October 27, 1981 – Salem Al Fakir, Swedish singer and keyboard player.